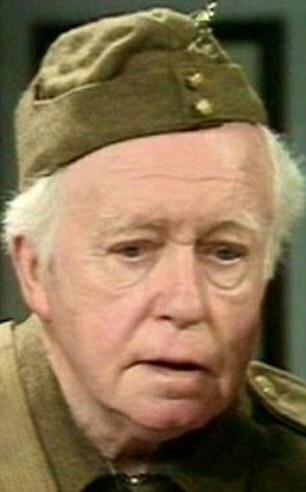 Supposedly, Arnold Ridley used to get impatient at the slow pace of filming of Dad’s Army, very possibly because his was the smallest of the ‘front row’ roles and so he had least to do. It has been harder to pick moments centring on Godfrey for this reason, but one episode stands out – Branded. This episode, from the third series, is undoubtedly one of the best and most touching. A random encounter with a mouse leads the gentle Godfrey to question his killer instinct, to resign from the Home Guard and admit to Mainwaring that he was a conscientious objector during the First World War. Mainwaring is outraged and poor Godfrey is given the cold-shoulder by the rest of the platoon. A bungled exercise leads to Godfrey having to rescue Mainwaring from a smoke-filled hut and, while visiting the recuperating private, Mainwaring discovers that far from being a coward he was awarded the Military Medal for bravery in the Medical Corps. His honour restored in the eyes of his comrades, Godfrey returns to the platoon as medical orderly. It is a cheering ending but this episode certainly plumbs the depths of pathos when poor Godfrey is being shunned by the platoon and it is lovely to see the character at centre-stage. This entry was posted in blog on July 23, 2018 by wolAdmin.